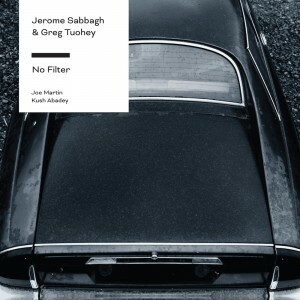 French saxophonist Jerome Sabbagh, a member of Paul Motian’s last trio, and New Zealand-bred guitarist Greg Tuohey rekindle a close musical partnership from their Berklee College of Music days on this engaging quartet outing. Joined by the flexible rhythm tandem of bassist Joe Martin and drummer Kush Abadey, Sabbagh and Tuohey present seven fresh originals that pack a potent punch, swing with a quiet authority and tug at the heartstrings. Sabbagh’s sinister opener, “Vicious,” has Tuohey bringing a decidedly rockish edge to the proceedings with his distortion-laced abandon, while Abadey swings freely, before unleashing a dynamic solo of his own. Tuohey flows with clean, warm tones on his melodic groover “Lurker” and his gentle ballad “No Road,” the latter underscored by Abadey’s sensitive brushwork and showcasing Sabbagh’s patient, singing tones on the poignant melody. Tuohey’s “Chaos Reigns,” the most adventurous track of the set, opens with a delicate arpeggiated guitar solo, before the full band delves into some collective exploring in a rubato mode. Sabbagh’s through-composed “Cotton” strikes a somber note with Tuohey’s minor-key chording, the tenorist’s plaintive long tones and Abadey’s mallets on the kit setting a dramatic tone. This superb-sounding album, which was recorded live in the studio without edits or overdubs to half-inch, two-track analog tape, ends on an cheerful note with Sabbagh’s lilting “You Are On My Mind,” recalling some of the relaxed, buoyant melodies from John Scofield’s Quiet or A Moment’s Peace.